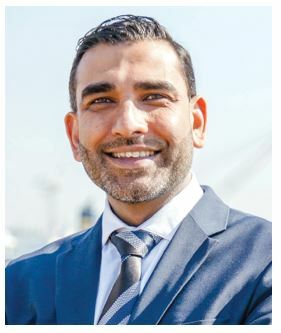 PRASHEEN MAHARAJ, CEO of the South African Shipyards career is driven by the African philosophy of "If you want to go fast, go alone. If you want to go far, go together". He added that this saying could not be more relevant today than in South Africa. "When I was in business school, I met the Father of Black Economic Empowerment, Dr Don Mkhwanazi, who then shaped my life from a business, political and personal perspective. Ndonga left me with the task of applying knowledge, networking and entrepreneurship skills to address the issues of inequality, poverty and unemployment. As a result, I sit as a Council Member of the Durban Chamber of Commerce and Industry, a Member of the Board of Directors of Ethekwini Maritime Cluster and a Member of the Shipbuilding Committee of the Aerospace Marine Defence Industry Body. Through these platforms our task to fast track the transformation that this country so desperately requires. Maharaj completed his post graduate studies at the former University of Natal. His career commenced in financial services, where he was involved in the insurance industry, international currency and derivatives trading, asset management and corporate finance. Maharaj co-authored the KZN Provincial BEE strategy in 2004. Another early influencer was investor and financial journalist, Richard Cluver, whose articles and books he read religiously from the age of 11 years. In his teenage years and young adult life his uncle, Vishnu Sharma, a property mogul, taught him a lot about entrepreneurship and business moral ethics. "I also learnt to be a principled business leader. The Prasheen you meet today will be the same Prasheen you will meet next month. I have a moral code or a set of guiding principles by which I make leadership decisions, which leads to consistency in decision making. Consistency leads to less volatility and hence more trust with stakeholders." "Shipbuilding and Ship repair are by their nature social enterprises. It's very labour intensive and supports a large supply and sub-contractor chain that is made up primarily of SMMEs. As a conscious capitalist and a socialist at heart, this is the main appeal of the marine engineering industry to me. The ability to run a business and make a profit whilst contributing to the greater good of society is a common theme in all my business and personal endeavours." Maharaj reflected, "Going back to our African roots, it is perhaps opportune that we begin to explore the concept and possibilities of the collaborative economy or sometimes called the sharing economy. We cannot continue to condone an environment where we have islands of prosperity in a sea of poverty, unemployment and inequality." Southern African Shipyards has made major leaps and bounds towards employing the concept of the collaborative economy in the execution of its shipbuilding and ship repair projects. The recently awarded contract to build a Hydrographic Survey Vessel (HSV) for the South African Navy represents one of the most complex projects to be undertaken in the African continent in recent years. Maharaj says that he is a great fan of long term financial sustainability versus short term profit maximisation. This outlook has been influenced by great investors like Warren Buffet and Allan Gray. Creating long term predictable, consistence and solid growth is far more respected in the business environment than profits and performance that swing between the extremes. "What this means for shipbuilding and the ship repair is that we need to secure long-term order books for shipbuilding and enter into long term maintenance contracts with our ship repair clients. This requires that the shipbuilding/ship repair industry become more customer centric and project performance orientated. This is a fundamental shift from the current mind-set of the industry that is currently inward looking." "I think the shipbuilding and ship repair industry is ready for consolidation from both a national level and international level. This industry is about scale, efficiencies and economies of scale. "Bigger is better" definitely applies to our industry," says Maharaj. Soon, Maharaj will be looking to merge with a local player in the industry to create a giant on the African Continent. The new merged South African entity will look for global partnership and/or merger and acquisition opportunities in other emerging markets/ developing countries. Creating a Team South Africa and a Team Africa approach to business is critical to the re-industrialisation and sustainability of industries not only in South Africa but the continent. "A balanced family-work life is critical to business success, especially in the tough economic conditions we face these days, where both sound emotional and physical health is required to navigate these choppy waters. Spending quality family time with my better half Marcina and my children Milahn and Mekhai is my escape from the realities of the harsh business environment we operate in. They are not only my pillars of strength but my moral compass by which I execute my day to day business functions. It's important to me that my family is proud of all that I achieve in the business world. There can be no moral compromises in the achievement of material gains."